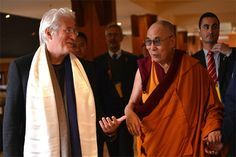 Hollywood, July 16.– When Richard Gere walked the red carpet at the Academy Awards in 1993, there was no way he Richard Gere with the Dalai Lamacould have known that the night would have repercussions for his career more than 20 years later. Invited to present the award for best art direction, he skipped the scripted patter to protest China's occupation of Tibet and its "horrendous, horrendous human rights situation." The late Gil Cates, the show's producer, was furious, calling the political speeches at that year's awards show —Susan Sarandon and Tim Robbins also went off script to speak on behalf of Haitian refugees — "distasteful and dishonest" and vowing to ban all three from future Oscars broadcasts. But now that Hollywood is cozying up ever closer to the authoritarian superpower, and studios are careful not to offend the government that oversees what has become the world's second-biggest box-office market, the star also is paying a price. "There are definitely movies that I can't be in because the Chinese will say, 'Not with him,' " he acknowledges matter-of-factly. "I recently had an episode where someone said they could not finance a film with me because it would upset the Chinese." ¿De qué se hace un tirano? De la vileza de muchos y de la cobardía de todos.